Trial will rely on new technologies to help the network deal with electric vehicles. UK Power Networks prepares for a surge of electric vehicles. A British distribution network operator is embarking on a project to help the grid handle electric vehicles while avoiding £271 million (USD $378 million) in upgrades. 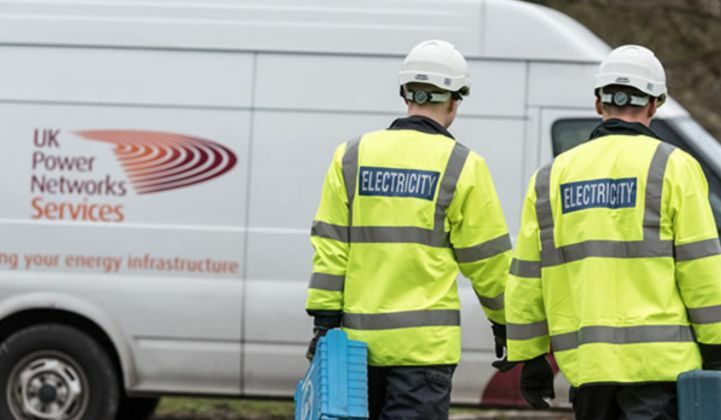 UK Power Networks believes its "active response" trial, which kicked off this month, could hold the key to creating “a responsive, automated electricity network that reconfigures itself constantly, moving spare capacity to where the demand is,” according to the operator. By 2030, the network could help UK Power Networks offer services to up to 1.9 million electric vehicles across London and the east and southeast of England. EV registrations are already 15 percent above forecasts in the company's service territory, according to an electricity network innovation competition submission last year. EV uptake is expected to accelerate further amid U.K. plans to ban sales of internal combustion engine vehicles from 2040. By 2030, National Grid predicts electric vehicles could add 3.5 gigawatts to peak demand across the U.K., the submission said. UK Power Networks is hoping to avoid some of the cost with the implementation of three novel technologies. The first is a power electronics device called a low-voltage soft open point, which can be used to control power flows between feeders. Another device, called a soft power bridge, will provide similar functionalities in the high-voltage network. Finally, new automation and optimization software will control both types of devices and help balance loads, avoid constraints and reduce losses. As well as dodging the need for grid upgrades, UK Power Networks hopes the technologies will free up 4.2 gigavolt-amperes of capacity and save 448,255 tons of carbon dioxide-equivalent emissions by 2030. The trial is expected to last until November 2021 and is being carried out in collaboration with network operator SP Energy Networks, energy consultancy Ricardo, power electronics developer Turbo Power Systems, and IT giant CGI Group. The technology would likely be taken up as well by SP Energy Networks, an Iberdrola subsidiary which owns and operates the electricity transmission and distribution network in central and southern Scotland, Merseyside, Cheshire, North Wales and North Shropshire. However, UK Power Networks acknowledges there is “significant innovation risk” in the project, not least because the soft open point and soft power bridge technologies will rely on silicon-carbide semiconductors that have not been proven on distribution networks. The U.K. is investing “hundreds of millions” of pounds into research programs such as active response, he said, putting the country at the head of European moves to adapt the grid to mass vehicle electrification. And the active response project can only provide part of the answer, said Andrew Scobie, executive chairman of secretive transformer technology developer Faraday Grid, which is also being supported by UK Power Networks and SP Energy Networks. “The project will enable existing capacity on the network to be used better, routing energy through lighter network paths or acting as a bridge between them,” he said.